Unjani Clinics’ work in saving lives and helping communities in need was recently given a powerful boost in the form of advanced new refrigerators that do not rely on electricity to ensure that medicines and vaccines are properly stored and their efficacy maintained. 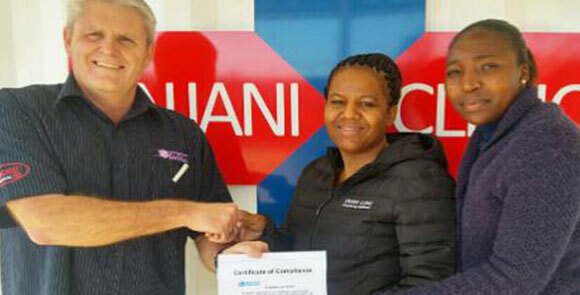 The brainchild of Dr Iain Barton of Imperial Logistics, the nurse-owned and operated Unjani Clinics are alleviating congestion in South Africa’s stretched and under resourced public healthcare system. Today there are 34 Unjani Clinics serving communities in Gauteng, North West Province, Mpumalanga and Limpopo. Elaborating on the increasingly vital role that the clinics are playing, Lynda Toussaint, CEO of the Unjani Clinics Non-Profit Company, reveals that the Unjani Clinic network has immunised more than 30 000 patients in the past 24 months. It has partnered with South Africa’s Local Departments of Health in its Extended Programme for Immunisation (EPI-SA), the purpose of which is to reduce childhood diseases that can be prevented by the immunisation of children and women. Vaccines against rotavirus diarrhoea and pneumococcal infections have been added to the EPI schedule. A problem that was being faced by Unjani Clinics, however, was that the basic bar fridges originally employed by the clinics were not proving effective in keeping vaccines and medicines requiring refrigeration cool. To resolve its refrigeration problem, Unjani Clinics partnered with medical refrigerator supplier Zero Medical and Johnson & Johnson, who provided funding for new, state-of-the-art Sure Chill fridges for most of the Unjani Clinics. Using advanced technology, these fridges maintain a temperature of between two and eight degrees for up to five days, so power outages do not affect the fridge temperatures, and vaccines and medicines are kept safe and effective. There are two fridge models. The mains (AC) version requires just a few hours of power per day, once the system is fully charged. The direct solar version is a unique fridge, operating even at low light intensity and requiring no batteries for energy storage. Unjani Clinics has installed 33 mains (AC) operated Sure Chill fridges, and one solar powered model, which is being used in Hammanskraal, where there is no electricity supply, Toussaint reveals. A further benefit of the fridges, she notes, is that unlike conventional vaccine refrigerators, Sure Chill technology will never form ice on the cabinet walls, so there is no risk of vaccines being frozen. This project has ensured that Unjani Clinics can always provide safe, effective vaccines and medicines to South African patients. “These high-tech fridges place the Unjani Clinics in a league of their own as we are now equipped with World Health Organisation (WHO) approved cold chain technology,” Toussaint states. In addition to the benefits to patients, the investment in the new fridges had an important corporate social investment element, she adds. “We partnered with Zero Medical because the company sponsored one gas stove, one 40L freezer and one two-plate stove for every Sure Chill fridge that Unjani acquired.” Unjani Clinics was delighted to be able to pay the kindness forward by donating these sponsored goods to community-based non-profit organisations, including Kids Haven, Life Line, POWA (People Opposing Women Abuse) and the Mali Martin Polekegong Centre, which cares for and supports abused women and children.